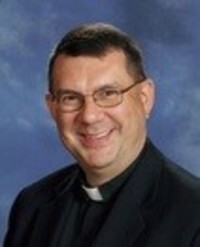 Father Steve Hoffer moved to Las Vegas from Grand Haven, Michigan, in 1990 and immediately became active at his parish, Holy Family. He was in charge of the Boy Scouts of America Troop 249, taught catechism and joined the Knights of Columbus. Not in his wildest dreams did he imagine eventually becoming the pastor of the church. He was ordained into the priesthood in 2005 and had assignments at St. Peter’s, St. Elizabeth Ann Seton, St. Francis of Assisi and St. Anthony of Padua in the Las Vegas and Henderson area. Then, in December of 2016, he received a phone call from the Bishop’s office with a new assignment — a dream assignment, really. He would return home to Holy Family to become the pastor effective Jan. 1, 2017. Let’s get to know Father Steve. Who is your favorite patron saint? My favorite Patron Saints are St. Francis of Assisi and Saint Fiacre, because they are associated with animals and gardening, especially St. Fiacre. Which Bible verse that provides inspiration? Matthew 24:16: Anyone who wishes to follow me, must deny themselves, take up their cross and follow me. What’s your advice for young men considering the priesthood? Have fun. I would say listen to your heart. If God is tugging and you feel a nagging, don’t ignore the call, check it out. Talk to someone about it. It is not crazy to think about the priesthood. It is a wonderful, fulfilling and fun life to serve others as a priest. If you think you are called, check out the website: www.vocationnetwork.org, or talk to a priest. What’s your favorite meal? Anything that is gluten free. I love chicken and Pho. Where’s your favorite place to eat? Johnny Mac’s, Pho T, Ichabods. What kind of music do you like? I like Christian music (KSOS), and the 70s and 80s Rock, and some country western songs, especially Willie Nelson and Alabama. Who is your favorite sports team? Anything Detroit (but they won’t go anywhere in my lifetime): Lions, Pistons, Red Wings, Tigers, and the Las Vegas Golden Knights. If you could vacation anywhere, it would be? I would love to vacation in Vietnam, Philippines, New Zealand and the islands of the Pacific Ocean. In your free time, what are your hobbies? Hiking, working out in the gym, gardening, working with youth and Boy Scouts, serving as advisor for Alpha Phi Omega, stitchery (crewel), making rosaries, and hiking to the highest point in each state in the United States (I have 42 states done).